The combined V, RC and I images of the merging galaxy cluster MACS0417 observed with SuprimeCam mounted on the Subaru telescope. Credit: Pandge et al., 2018. Recently, a group of researchers led by Mahadev Pandge of the Dayanand Science College in India, has decided to conduct a multi-wavelength analysis MACS0417. The scientists analyzed optical data from NASA/ESA Hubble Space Telescope and Subaru telescope in Hawaii, as well as X-ray data obtained with NASA's Chandra X-ray observatory. The study also includes radio data acquired by the Giant Metrewave Radio Telescope (GMRT) in India and observations with Caltech 10.4m Submillimeter Observatory in Hawaii at 2.1 mm wavelength. "In this paper, we present a detailed, multi−wavelength analysis of MACS0417 by combining the existing Chandra X-ray observations with Subaru and Hubble Space Telescope optical archival observations," the researchers wrote in the paper. Furthermore, the research identified a surface brightness edge in MACS0417, near the location of the radio halo. The edge is located towards east-south direction, approximately 831,000 light years from the cluster's center. The researchers noted that this sharp emission edge is a cold front. "The overall structure, surface brightness profile, temperature and metal abundance values point towards the presence of a sloshing induced cold front in this system," the paper reads. The findings allowed the team to classify MACS0417 as one of the exceptionally rare cool-core clusters hosting an ultra steep spectrum radio halo. The main more massive cluster is the parent, and therefore ejecting more new gas therefrom the central core than the daughter sub cluster. The massive the core, the more newly formed matter is ejected. Simple, but for the foggy mind of the all too common merger maniac. Christ, you talk some crap! Not very bright today, are you. And so your counterargument against Tuxford is......?? Given that the poster is a crank, and has zero backing for his delusions, I don't need a counter argument. His ramblings do not appear in the scientific literature, and are just uneducated musings on a comments section. Therefore they can be safely ignored. The paper itself is the counter argument. Some loon's misinterpretation of it here is neither here nor there. 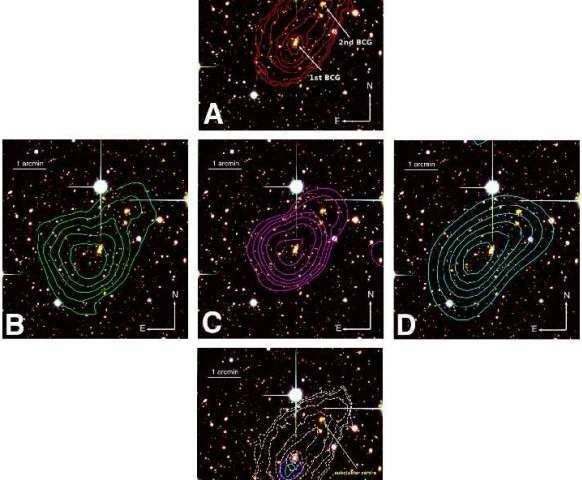 This is not a merging galaxy cluster but, on the contrary, scattering newly formed galaxies. No, that won't work. Their movements are clear from spectroscopy. So is the movement of the gas.